You are here: Home / Blezard, Sharron / Offensive? You Bet! Do you find the teachings of Jesus difficult and offensive? No? Then perhaps you’ve been handed the sweetened and condensed version for easy consumption and digestion, the one that allows you to accept Jesus as your personal savior and friend without any relational backwash or hide-off-your-back investment. This version of the gospel makes you feel good most of the time, and when it doesn’t, you can simply put it back in its box and bury it on the shelf behind the remains of the dusty Precious Moments collection to be ignored until the next crisis of faith. A bit too harsh? Maybe, but the point is that the gospel of Jesus has been offending people on a regular basis for more than 2000 years. It is not pretty. It is most definitely not easy. And it requires a total commitment that makes P90X look like a cakewalk. If it was easy and fun and immediately gratifying, I imagine our church buildings would be bursting at the seams on Sunday morning. But that simply is not the case, and it never has been. I think that is why those who shepherd congregations tend to gloss over or downplay Jesus’ discussion about eating his flesh and drinking his blood. Why are we so willing to speak with absolute authority on some scriptural teachings but tiptoe delicately around others? 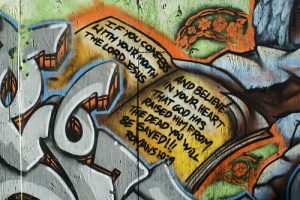 It may have something to do with ensuring there are folks in the pews and that we’re not so controversial that congregants plug their ears and harden their hearts against our words. Yet playing it safe and the good news of Jesus Christ are not compatible. When we try to act like they are, we do a gross disservice to those we serve. Jesus’ words in this chapter of John’s gospel do comprise a hard teaching. Not only does it sound offensive when taken at face value–cannibalism and vampirism–but it is even more offensive to our modern ears when we hear it as a total commitment. The kind of commitment Jesus is talking about here is so deeply connected and rooted that we literally consume him and are consumed by his love and grace. We no longer can lay claim to the illusion that we control our destiny, much less our lives. According to Jesus, it is not even our decision to come to him; we are drawn into the net of salvation by the Creator of the Universe. So much for any hint of bootstrap mentality! What are we to do with this difficult teaching? How about preach the truth in love? Where else can we go? No one else can offer the promises of Jesus. No other source will expect us to give our all in order to be all that we were created to be. No one on this earth, no matter how well intentioned, will love us like Jesus. No one else, especially not ourselves, can save us. When the truth is made plain, when everything is laid on the table, there really is no other way and no one like Jesus. With Simon Peter, we can answer “Lord, to whom can we go? You have the words of eternal life.” We sing these words in the liturgy, so it seems like we ought to believe them, to feast on them, and to consume them. As you prepare to teach and preach this coming Sunday, may the Holy Spirit guide you with words and wisdom so that you in turn may equip God’s people to say “We have come to believe and know that you are the Holy One of God.” And in equipping them, may you be empowered to illumine the path of faithful and fully committed discipleship. Don’t be afraid to take the offense with the offensive. You are not alone; God goes with you and with every word you speak. Blessings on your proclamation! 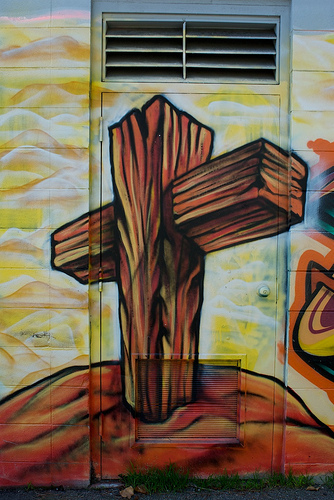 Consider talking with youth about what they find offensive in the realm of faith and religion. Ask them what makes them feel this way or what triggers an offensive reaction. What other aspects of life and culture do they find offensive? Why? Next, ask them to consider their own faith. Could it be considered offensive to others? Do they ever find the challenges of discipleship offensive or difficult? Why? Why not? Should faith be “offensive” or even counter-cultural? Would they be willing to be “offensive” or “different” or “weird” or “nerdy” or whatever other labels people might give them for the sake of the gospel? Point out that many of Jesus’ disciples left him at this point in his ministry because the teachings were too difficult and controversial. Talk about Peter’s response in verse 68: “Lord, to whom can we go? You have the words of eternal life.” How might these words apply today? Have a bag or box filled with various components of “armor” of God. It’s alright to be a little silly with crafting these pieces. You will need a “belt of truth,” a “breastplate of righteousness,” “gospel of peace footwear,” a “shield of faith,” a “helmet of salvation,” and a “sword of the Spirit.” Again, be creative with how you image these articles of clothing and accessories. You might use galoshes for the footwear, a football helmet, a Star Wars light sabre with a “Bible” handle, and so forth. Deck out one volunteer in the crazy garb and talk about each piece and why it’s important. Have fun with it. Alternately, you can call on an adult who will willingly play along and dress that person (much to the delight of the children). Then tell the children that the good news is that we don’t have to wear silly clothes to be disciples. Each of these items can be carried within us, as part of who we are in Christ Jesus. End with a prayer that each child will be surrounded with God’s presence and dressed for discipleship success both inside and out.